This entry was posted in Reviews and tagged agriculture, architecture, biomimicry, climate change, communication, education, environment, global warming, harmony, health, nature, prince charles, prince of wales, science, sustainability, uk by climatesight. Bookmark the permalink. 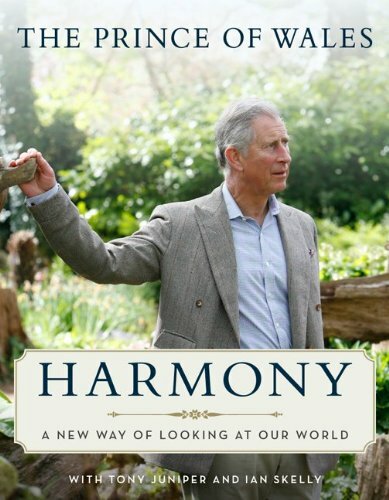 There is a limit to how far Prince Charles ‘romanticism’ travels in respect to environmental sustainability. His views on architecture limit the innovations possible in cutting carbon emissions and resource use. We are in a situation now where technology and innovation is the only way in which many environmental problems can be solved, that includes architecture. Other areas, he is broadly correct, although on the issues of ‘alternative’ therapies, he has probably also lost the plot. Thanks for sharing this and for pointing out Islamic Architecture. We are keen to find what Prince Charles had to say on Islamic art and architecture. While I have my doubts about altenative medicine, who cares if it works. Even if it is a placebo effect, relief from pain is welcome. Full disclosure: I’ve been involved in the fight against homeopathy (one particularly pervasive branch of alternative ‘medicine’) for a while. Basic overview from the CBC, if you’re not up to speed with this. Kate, the problem comes in assigning the cause of the healing not to placebos, but to surrogates for the placebo. For instance, no one buys bottles of sugar pills since the placebo effect works – rather, placebos are only intended to be used during medical research, to determine if a particular piece of medicine has an effect beyond spontaneous remission. Alternative medicines are essentially doing the same thing as selling people the placebo and gambling on it to heal them. There are obvious ethical concerns with this, but it also has two serious health-related concerns as well. 1 – Marginal cost to self. This is what Tony’s trying to justify. If alternative medicines make the pain go away (read: if you spontaneously recover or have a placebo effect), then what’s the harm? The harm comes later on, in trying to use the same “alternative medicines” instead of evidence-based medicine to recover. People have died because they have sought out homeopathic, traditional Chinese, or religious-based treatment instead of actual medical treatment. This has a twofold effect: It not only places yourself at risk, it empowers those who prey upon the gullible. Think about it – what else are the people who peddle alternative medicines except elaborate snake oil salesmen? They make their money by convincing people to risk their health, and the reason they do that is because people don’t think critically about these things – or at best, they ask, “what’s the harm?”. We can continue to pressure for better medical regulation to hamstring these bastards, but a more effective measure would be taking their market away, which can be done simply by educating the people about what they’re buying – i.e. understanding “what’s the harm”. Now, you might argue this is fine, everyone has the right to do what they will with their own life. And I can accept that – even as I challenge what are objectively verifiable bad ideas, I can understand the argument and leave the final choice to you. 2 – If the condition you’re trying to treat puts others at risk, then your lack of critical thinking is a tangible threat to other people’s health. The most obvious example is vaccination. Some people are medically unable to be vaccinated (allergies being a common reason), and instead rely on herd immunity to protect them. If enough people decide not to vaccinate, they breach herd immunity, and place large segments of the population at risk. Diseases that are under control can actually make a comeback (Polio comes to mind, but more recently in England even measles has had outbreaks). Tony, if the goal is mere removal of *this particular* pain, then I suppose you can make an argument that the difference doesn’t matter, right now. However, if the goal is understanding the pain so that it can be treated in the future, or in others, then a causal understanding is required. Every attempt at understanding the causes of pain and treating them points in the same direction as medicine, not (say) homeopathy or TCM [ED: Traditional Chinese Medicine, includes acupuncture]. Sure, the patient may subjectively be assured for a little while, but it doesn’t treat the problem – and that misdirection leads other patients to ignore conventional treatment in favor of platitudes. That is why I care. Or, to put it more succinctly, we can rephrase your comment as a simple “What’s the Harm?”. There are costs to wooly thinking – and not just to yourself, but to others as well. The two additional resources I’d suggest reading on this are Science Based Medicine and the absurdly proflic Orac’s Respectful Insolence. The latter also covers climate denial along with other pseudoscientific thinking, but as a surgeon his specialty is medicine. I would agree strongly. In the UK we have just fought off a government attempt to sell our residual forests to the highest bidder. Half a million people signed the online petition against it. Marches were held, a mock Parliament burned, and the letter pages and blogosphere swung strongly against it. Such sudden and strong determined opposition caught the government strongly off balance. I was left wondering what more we could achieve in conservation and Ecology if such energies could be chanelled into them. Sorry I am so late to the game, but I feel compelled to comment. Given this site’s fight against ideology overshadowing climate science, I am surprised you would not take Prince Charles to task. His views often place ideology over science, perhaps just not in climate science. But, you cannot expect to gain ground in the fight for climate science if you turn a blind eye toward other ideological threats to science. 1. It teaches that science does not matter. If you allow science to be belittled in one area, how can you expect science to matter in your area of interest? 2. In the US, this has led to the establishment of the NIH’s National Center for Complementary and Alternative Medicine. More than $100 million has been spent on research that has produced a big fat zero. Wouldn’t you prefer that this was spent on a science that matters, like climate science? In the end, you cannot accept science because it aligns with your ideology. You must adopt ideologies that align with the science.